Ah, the Head of the Charles. The world’s largest regatta brings together nearly 10,000 athletes from 37 different states and 23 countries and over 400,000 spectators across two days of competition. People from all over the world converge on the city of Boston to watch over 2,000 boats in 55 different events make the winding 3-mile trek through seven bridges on the Charles River, hopefully finishing in one piece and a little bit faster than all of the other boats. To put it in layman’s terms to the non-rower, it’s the Super Bowl of rowing. The 49th Head of the Charles Regatta (Oct. 19-20) marked my fourth time attending and third time racing the regatta. My first HOCR race was the fall of 2010 when I had just picked up rowing. I barreled down the course in a coxed four (4+) competing in the Women’s Club Fours division as a member of the Riverfront Recapture rowing club, based out of Hartford, Conn. That’s a long ways away from the 2013 World Championships I competed in this year as a member of the United States National Team. Humble beginnings. As I have become a more experienced HOCR racer and attendee, I quickly found that returning to Boston for the Head of the Charles is like having a high school or college reunion every year. The rowing world is small and feels very much like a tight-knit family; but for one weekend, we take over the city of Boston and make rowing feel like a pretty big deal. There are actually spectators! And lots of them! Outside of the World Cups or World Championships, this is the biggest race and for many it is the biggest race. From pre-teens to veteran rowers well into their 80s, the Head of the Charles is the ultimate regatta. The fact that Olympians, junior rowers and master’s rowers share the same race course for a weekend is part of what makes the weekend so special. This year I competed with the University of Virginia in the alumnae 8+ event on Saturday, and with “Beat Cancer Boat Club” in the Director’s Challenge mixed quad (DCM4x) event on Sunday afternoon. Going into the weekend, I thought racing two events would be awesome. And then you race in your first event and realize how much it’s going to hurt the next time. Nevertheless, it still ended up being pretty awesome. UVa won the alumnae 8+ and we managed to set a new course record, I might add. This was an especially cool experience for me since I didn’t actually row for Virginia (I played softball and volleyball at UVa). 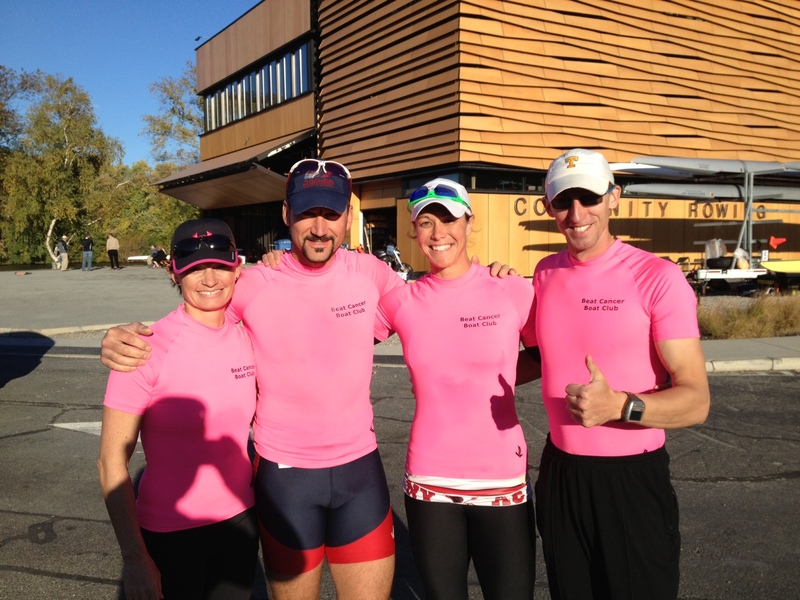 Beat Cancer Boat Club placed 2nd in the DCM4x, but posted the fastest raw time in the event. Age handicapping put another boat ahead of us by three seconds. It was a blast racing for a good cause and with some of my good friends I don’t get to see all too often. Outside of my personal experience, this year’s Head of the Charles saw some fast times and great races. Twenty new course records were set on Saturday with racers taking advantage of the fast conditions. The women’s championship eight event saw a tight race between the 2013 world champion U.S. Women’s Eight and the Great Eight filled with some of the world’s top scullers, stroked by U.S. single sculler, Eleanor Logan. The Great Eight came out on top, edging the U.S. Women’s Eight by 1.2 seconds. In the men’s championship eight event, the Dutch national team finished 1.48 seconds ahead of the U.S. Men’s National Team eight to win their first HOCR title in history. 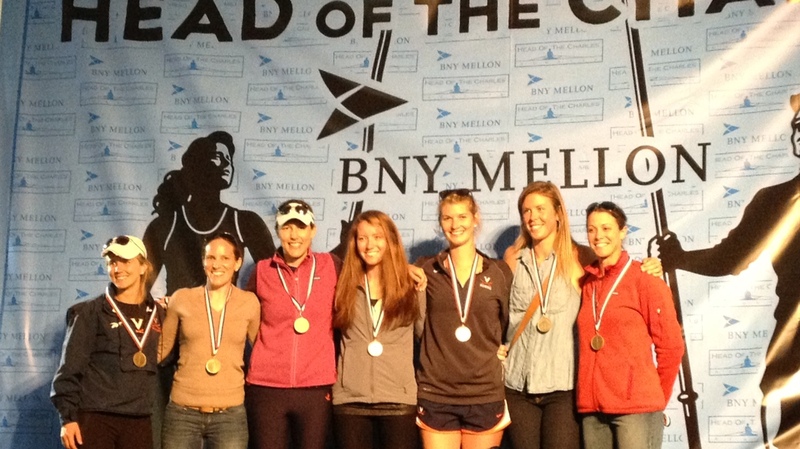 University of Virginia Alumni 8+ HOCR Champions and new course record holder. In the women’s championship single event, Kate Bertko crossed the line 2.5 seconds ahead of 2012 U.S. Olympic single sculler and 4-time HOCR winner Gevvie Stone, to set a new course record of 18:33.015. In the men’s championship single event, Norwegian Double Sculls 2013 World Champion, Kjetil Borch won in a blazing time of 17:12.313, also setting a new course record. The weather was beautiful all weekend and aside from the windy and less than fast conditions on Sunday, it was perfect weather for fall rowing. It was great to see friends–old and new–and come together with thousands of other people who share the same passion for a sport so foreign to others. I know I can speak for thousands of other rowers around the world when I say that I’m already looking forward to next year’s annual pilgrimage to Boston for the Head of the Charles.